An average of 6,000 dolphins are killed each year on France’s west coast by large industrial trawlers and fishing vessels. That number could be as high as 10,000 according to the Pelagis Observatory, based in La Rochelle. This is much more than the dolphin massacres of the Danish Faroe Islands and Japan's Taiji Cove combined. These vessels target sea bass spawning grounds during the breeding season, but also catch dolphins that typically live alongside them. Most of the dolphins die in the nets or from wounds inflicted by fishermen onboard the vessels. This practice not only threatens sea bass populations, but is also deadly to dolphins trapped and drowned in the nets as bycatch. 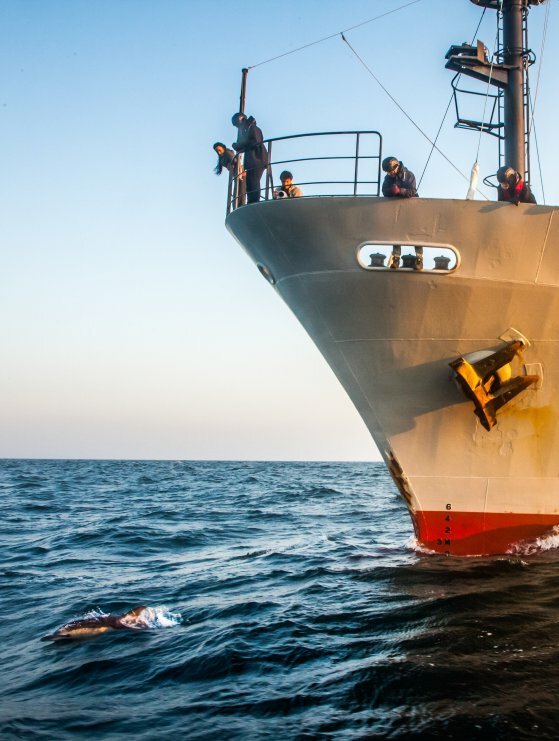 April 18, 2019 - After two months at sea, our dolphin defense campaign on France’s Atlantic Coast is coming to an end, at least for this season. Commentary by the Operation ByCatch campaign director Lamya Essemlali, President of Sea Shepherd France.